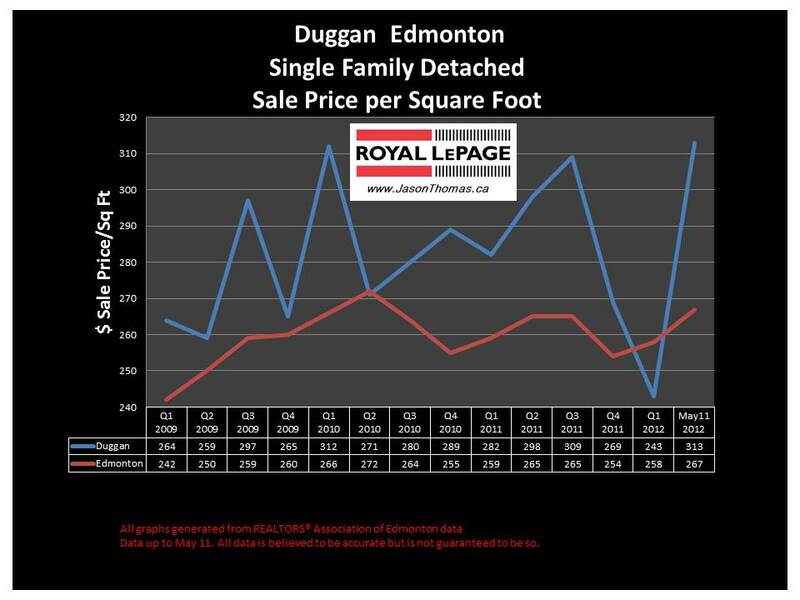 The Duggan Edmonton real estate average sale price per square foot has been a bit of a "yo-yo" the last few quarters. Duggan has seen it's average selling price per square foot range from a low of $243 to a high of $313 in the last few quarters. The general trendline for Duggan's average sold price per square foot is up other than a couple of weaker quarters at the end of 2011 and beginning of 2012. The highest sale price for a house in Duggan in 2012 has been $437,000. The average selling price for a home in Duggan year to date has been $372,707. The average time to sell a home in Duggan in 2012 has been quick at 27 days. That is roughly 20 days faster than the Edmonton average days on market in 2012. Visit Duggan Edmonton home values to find out what your home is valued at in today's real estate market.